Based on oil analysis, benchmarks can be set and machines with critical levels can be identified quickly. 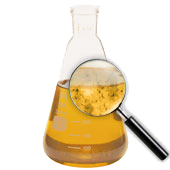 Oil analysis are the only method to get reliable feedback about your oil & machine condition. 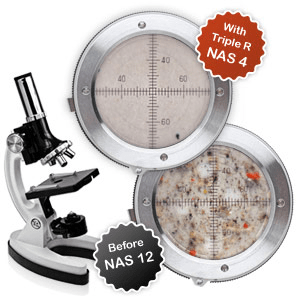 Triple R Europe is cooperating with various oil analysis laboratories, like WearCheck or Filtrex Services, all independent laboratories. Apart from the basic oil data, like the viscosity, oil acidity, water content, spectral analysis... we always perform a PARTICLE COUNT. In our opinion that's of upmost importance because the chemical properties might be okay, but your oil might be far too contaminted by solids and sludge. And in that case your machine is definitely in trouble. So better check and know about the various pollutants too. Send us a message to get a price quote. Derive the oil from a preferably upwards pointing pipe with continuous flow to produce a representative sample. Sampling points fitted on the lower perimeter of a pipe tend to allow depositing of particles in the sampling valve. A sample taken between the pump and the filter housing of an off-line filter is normally the worst contaminated part of the oil system, and therefore the most representative for the total systems contamination load.. If no off-line filter system is installed a vacuum type sampling pump is a valid option. In such case the sample should be drawn 10 cm off the lowest part of the tank. When sampling for particle counting the method is very important. Remember that you can never make a sample any better (cleaner) than the oil in the system, but it is easy to make it worse. Spectral Analysis (wear metals and additive package). 0,8 micron Millipore filter membrane for Sludge detection. 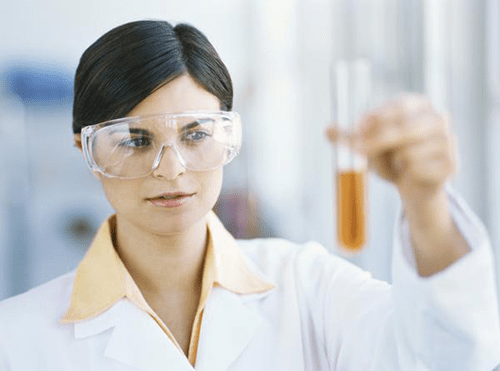 Viscosity : the viscosity is expressed in cSt. For hydraulic oil typical oil viscosity are 32 cSt, 46 cSt and 68 cSt mg/KOH gr. 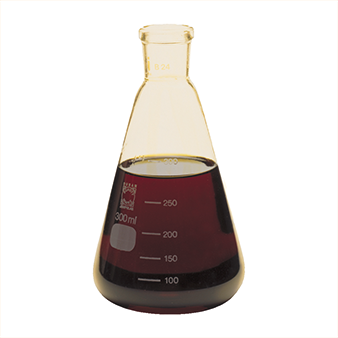 For lube oil typical oil viscosity are 220 cSt and 320 cSt. The oil viscosity may vary within a range of 25% up or down the initial viscosity. Meaning that a 46 cSt oil will still be within an acceptable range if the measured viscosity is between 33 and 59 cSt. Acidity Level : Total Acid Number (TAN): the acidity level or TAN is expressed in mg/KOH gr. Every oil has a maximum TAN value. Ask your oil supplier about your oil maximum TAN level. Typically for hydraulic the maximum level is 1,0 mg/KOH gr. New fresh oil will start around 0,2 mg/KOH gr. Spectral analysis : measures the wear metals and the additive package. BUT, note that a spectral analysis is not a substitute for a Particle Count. Typically a spectral analysis is measuring elements with a size below 3 micron, solids but also liquid or chemical compositions! Important is to have the possibility to compare multiple spectral analysis, and to check about the trend. Are the wear metals increasing significantly? Are the additives vanishing? Download the iso 4406 pdf file. 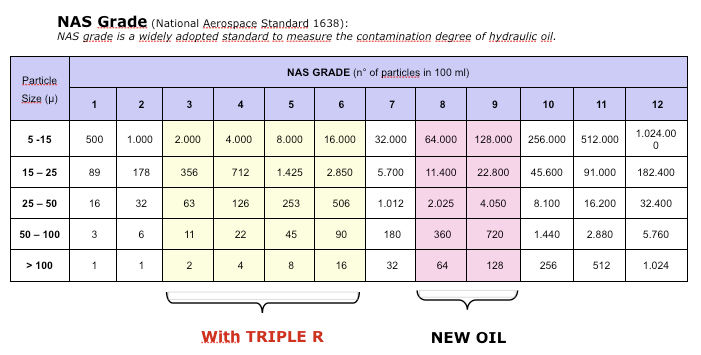 NAS 1628 is a American standard that references the contamination load based on a breakdown of the different particle sizes for specific particle sizes: 5 to 15 micron, 15 to 25 micron, 25 to 50 micron, 50 to 100 micron, >100 micron. Download the NAS 1638 pdf file. >> Click and download this file with our Cleanliness Recommandations. For every oil-filled system, a cleanliness target should be specified. This is the basic requirement to insure reliability at the lowest possible cost. A millipore membrane can show oil degradation if a 0,8 micron cellulose membrane is utilized. In the implementation phase of a condition monitoring system, analyses must be made frequently – at least every six months – in order to establish a knowledge data base. Every oil system should have a log where analysis results are registered. The logbook must also contain information about oil type, oil changes, break-downs, targeted ISO class code and oil analysis results.